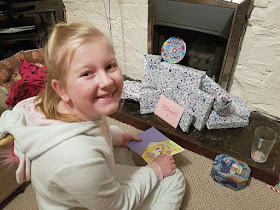 My beautiful girl turned 10 on the 17th January and as far as birthdays go this was indeed a milestone. Not only did Midge turn 10 but it marked 10 years for me as a mother to this gorgeous girl. As she was born into this world as was I, as a mother. What a journey it has been. Midge was so excited for her birthday she had been planning it since before Christmas! I kept begging her to let me get through Christmas but she wouldn't let me. I started noting down the gifts she wanted and passing the list to friends and family. 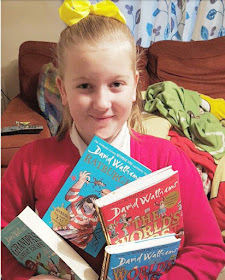 Her main wish was books, much to my delight. She woke up super early, which never happens on the morning of the 17th, dragging her brother and I out of bed to see her gifts waiting for her. She had gifts from her brother and myself as well as one from her grandad in France which she loved. She got a lot of books just as she asked for. The morning was interrupted by the showing of the cake and more annoyingly by the school run. Yep, school doesn't stop for birthdays! We left earlier to get some cakes from the local shop before heading off. I got to spend the day getting bits in for our family tea and I had more bits to buy for the upcoming party. 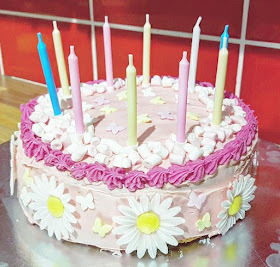 So my 'little' girl 10 and it marked a decade of motherhood for me too. 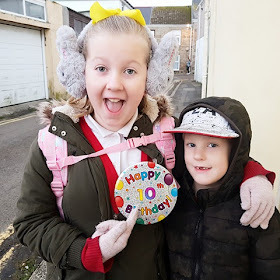 She had a lovely day at school, a family tea and a wonderful weekend with friends, she even had a friend come for a sleepover which was a lovely way to end her special day.